OK, I admit I got stuck. It seems that every year there comes this time for me where I have nothing new to say. And then it is a little difficult to get back on track again. I have been meaning to write a post about Myrrhe Ardente, the perfume that I wore the most all this time but it’s not coming out. Thankfully my friend Suzanne gave me a push to the right direction by writing about Habit Rouge eau de parfum. Her perception of this one almost mirrors my impression of it. As much as I love the aura of this room I cannot imagine myself living in that room, not even sitting down relaxed for a cup of tea! The exuberance of style and superlative detailing creates a claustrophobic atmosphere which seems to have the ability to devour everyone entering the room. This room is Diana Vreeland and there is only room for her in there. This is how wearing Habit Rouge EdT has always felt to me. So where does that leave any room for the eau de parfum? It is supposed to be stronger as it is in higher concentration, isn’t it? Well not quite. It opens with the familiar sweet, sharp citrus Lifesavers candy accord that seems to include every citrus flavour in the catalogue: lemons, bergamot, oranges, grapefruit, you name it, it is there by the handful.This is what Lifesavers factories must smell like. But right there from the start the differences start to appear. The sweet, artificial citrus is contained in a box made of precious woods. 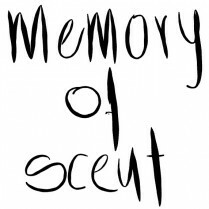 I can smell oud and I can tell you that this is the most beautifully incorporated oud note in western perfumery. And guess what, it has been there since 2003, long before the oud madness. No band-aid here, no cherry cola. This is just a pale woody note with a vibe of freshly cut tree, slightly acidic and and very dry. Vanilla comes next but it is not as sweet as in the EdT version. The woodiness persists and cuts down the sweet drama while it slowly gets a turn towards smokiness. It is not literally smoke, but rather the smell of a bonfire diluted and carried over in the air from a distance. Or at least this is my perception of this. It could just be a combination of leather elements everybody reports and the overall oily olfactory texture of this composition that I translate as a bonfire vibe. I also get a bit of hay that no one else seems to pin down. As Habit Rouge EdP progresses a rather familiar patchouli-benzoin combination dominates the composition, warm, sweet and powdery. Traces of the bombastic citrus opening remain during the drydown but the dry woodiness that laces the composition seems to be setting the tone. What makes the EdP so different from the EdT is not one particular element I think. Most of the notes are exactly the same and there is no doubt that both share the eccentricity and flamboyance. But where the EdT seems to be without a focal point, trying to create a masculine sweet, citrusy, vanillic potion, the EdP uses a mysterious woody aura with a light smoke element to create the much needed backdrop for the plot to unfold. It fills the gaps and tones down excesses while it allows all the elements to shine more beautiful. Every time I read someone characterize Habit Rouge as a masculine scent I really wonder how differently each person perceives scents or more accurately, how irrelevant gender assignment is for perfumes . To my nose it is a completely unisex scent if not bordering feminine and this is coming from someone who wears Feminité du Bois. I can describe it as Shalimar winning the female body building championship but this is as far as I will go. The EdP manages to swim over this dangerous reef and smooth all the edges. It has taught me the lesson that one must always reed the fine print: EdP. It doesn’t only mean “concentrated”. Sometimes a perfumer really takes the time to fine tune a composition and actually improve something that is already considered a classic. If you are interested on the ultimate synopsis on Habit Rouge please read the marvellous article by Monsieur Guerlain. He elucidates that the main difference of the EdP is toning down neroli and adding agarwood, which makes perfect sense to me as I always find it difficult to tolerate neroli. Christos, I’m so glad you wrote about this, as I could tell that as soon as I emailed you to ask about the bottle, I had touched off a little spark within you. Your review does Habit Rouge the justice it deserves (I knew it would!). I have a little more left in my spray sample, so I will try to seek out that oud note you speak of. We do see it quite similarly, except that I get more smooth leather than wood, but also I don’t think I studied Habit Rouge as well as I could have for that review … I sort of succumbed to the emotion it inspired. Now I must seek out the bombastic edt! Simply because I would like to be that shocked by it … to peer into that room where Diana Vreeland is sitting and then to slam the door when I’m done so I don’t break out into hives. Seriously, how could anyone have tea in that room? Thanks for the boost Suzanne! Nice article. 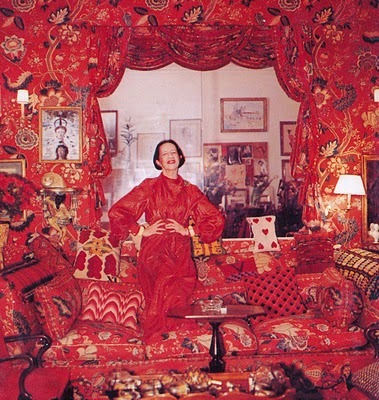 I thought of Iris Apfel when I saw the photo Vreeland’s Red Room. Apfel’s home has a similar claustropobic vibe. Incredible place! There is an element of humour though both in the house and on Iris Apfel herself that is missing form Vreeeland. Thank you for this informative article. I only have the EDC but it sounds like the Parfum will be a must have for me. It is really worth it! Of course now there is also the Parfum and Extrait versions that I haven’t tried. welcome back, Christos, I was a little bit worried by a too long silence.. When you have no perfumes to write about, just post a new picture of your handsome cat – most of your readers will be happy. My cat Rusty doesn’t wake us up either. He waits until we get up and start washing – and only then comes to the door and starts meowing (for food and attention). Hi Christos. Love to hear your thoughts on the Extrait de Parfum if you get the opportunity to try it. I smelt it in Paris last year and I was very surprised by how removed it is from the EDT and even the EDP (considering most other parfums I own are still strongly rooted in the family- perhaps because most of them started as parfums and the EDPs and Ts followed…). HR extrait is beautifully woody and deep, no lifesavers in sight! I visited La Maison Guerlain on a budget so I was limited to one bottle and I went for Rose Nacree du Desert but Habit Rouge Extrait remains on my wish list. Habit Rouge EdT is not really my favourite, it gives me the impression as if it was something especially for the very old gentlemen. 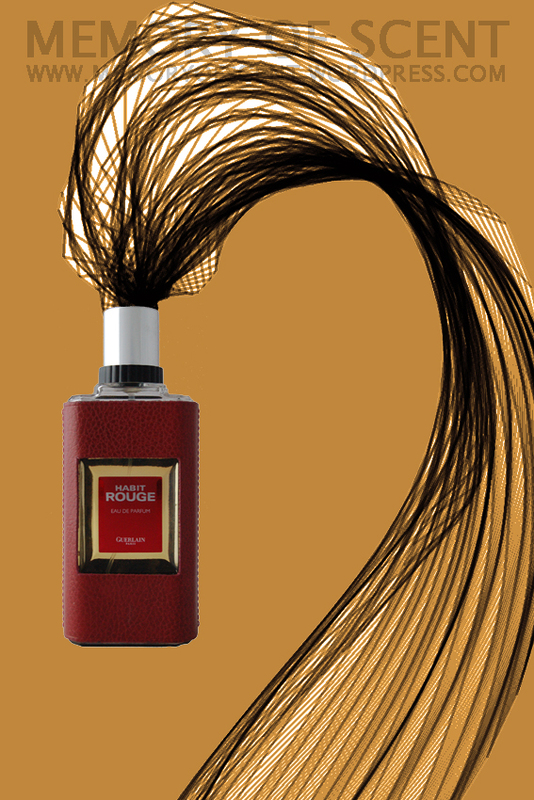 Habit Rouge EdP is a modernised version of the EdT, and I find it more accessible. In spite of the denomination, a simultaneous test of both reveals that the EdP seems to have even slighter less longevity! Some time ago, a friend from Parfumo send me a generous sample of his vintage Habit Rouge EdC. I still have to test it, but my expectation is that I will like it better. I think HR was originally created as EdC, and only when gents’ generally fragrances became stronger in the 1970’s, Guerlain eventually decided to issue the EdT version that we now regard as the original. Having said that, I am more interested in a lighter and fresher Habit Rouge experience, something that would not remind you at that Diana Vreeland photo. There are offers: Habit Rouge Légère, Habit Rouge Sport and Habit Rouge L’Eau. The discontinued Légère is a fresher and lighter version of the EdT with different citruses, indeed very convenient to wear. The Sport version is very much different from the EdT, it is a kind of creamy light musk perfume with slight hints of Habit Rouge and therefore, it could also be seen as a fragrance of its own. The new L’Eau version is in the middle of both. I am glad that in case of HR, Guerlain decided to bring out all those modern variants instead of replacing the original which they did with Vetiver in 2000. Thanks for adding your personal opinion on all these variants. From the sounds of it I may like the Legere version. Another one on the watchlist. I adore the EDT, but if you say the EDP has a more cohesive message, I might like that even better. Good work. As you probably have read from previous comments, there is a very wide range of Habit Rouge flankers and reformulations to keep us busy. You will love it if you have a soft spot for woody goodness. Thanks for the insight on the EdT vs. EdP versions. I have only smelled the EdT and it didn’t pull me in. Funny how some versions of the same fragrance can be so different. I love that picture of Diana Vreeland’s room. It would be like living in a constant state of an hallucinogenic nightmare! A brilliant article, and interesting for me personally in that I totally agree with you about the masculine/feminine thing. Shalimar smells perfect on me, where Habit Rouge is just too sickly sweet and feminine at the end. And like you, I appreciate its uniqueness but just can’t quite wear it. Another interesting point: I hadn’t even read your review but was writing about it myself last night, for Olfactoria’s Travels. Powdery synchronicity! I have never been able to get the leather note, especially on the EdT. Everything is dominated by the Lifesavers citrus and sweetness. Very handy article for me!! haha, just yesterday i sampled this and vetiver. HR is really striking and as you say [ might quote you on that so watch out ] it is an instantly distinctive smell. I tried the EDT and had no idea that EDP would smell different. I’ll have to get a sample of edp too if it’s offered around here and see the difference. This is a perfectly valid remark! I think we as Europeans still tend to see as our amusement park. It is good to see that the tables are shifting although I still do not know to what extent this will be and what it will mean for the arts and education in general. Would that mean that education will follow the money and become more utilitarian? I am not one to know, but my general feeling is that quality will last while the rest will perish and just as today we have great Rose scents, in the future we will hear about great OUD scents that would have become classics [ for example Potrait of a Lady for rose and maybe Royal Oud for Oud ]. As we don’t remember all the rose perfumes that populated history, we won’t remember this craze, but we will feel its influence. Still, going after the money is to be expected, at lest in its nascent phase.